There's no place like home...but I need a break from it. I'm going to see my sweet 3 year old grandson for a couple of days in Napa. I'll have the house to myself most of the day today and tomorrow and then he and his mommy will join me in the evenings. I really need the break from my routine...looking out over vineyards through an entire wall of glass ought to do the trick! So I'll write more later. Okay, this is how crazy it is to have spring weather in January...my daffodil bulbs are blooming for heavens sake! It's so bizarre! I didn't even know it was happening since I don't use my back terrace much these days. I heard a murder of crows out back and went to see what was up...but they were just landing in some nearby eucalyptus trees...and taking off...and cawing loudly...over and over and over. Guess they were just having fun? Anyway, to get a good look at them I had to go to the corner of my yard near my rock fountain...and that's when I saw the daffodils...gasp! I just couldn't believe it. I mean, this unseasonal weather is weird enough, but it's fooling flowers into blooming! Wow. To top it off, in my FRONT yard I was tossing some recyclables into the can...and there was this ladybug crawling on my tiki torch. Now if THAT isn't a sign of spring, I don't know what is. He did not like my picture taking though, he kept moving back and forth with each click. Out of 7 photo's, this was the only one that didn't blur...hahaha, funny. I'll finish with a snowy egret. These are common around here, although I have to drive a few minutes to get to open country or one of the 2 wildlife reserves. I just love these birds...pure white and so elegant. I enjoy the prepping they must do in order to fly by making a deep crouch while opening their wings. Really pretty. Okay, enjoy my sunshine coming your way no matter where you are. Don't let it frustrate you if you are impeded by snow. We've been heading toward drought levels for 3 years now and there is talk of water rationing next year and have been asked that in order to keep that from occurring we all try to cut water use by 10%. Things are NOT always beautiful in California when the weather appears to be so! 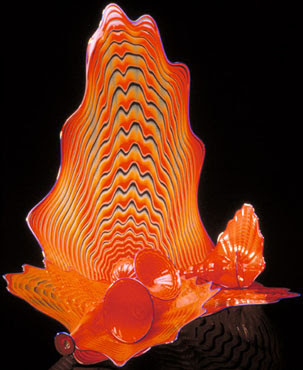 I wanted to blog but didn't have a topic...until I flipped my calendar page to February and there was this amazing orange glass work by Chihuly & I knew I had to blog about art...so let's take a little art walk. Our first art window featues Dale Chihuly's Cadmium Orange with Blue Lips...stunning. My calendar has a photo of a different angle and it looks like a completely different piece of art. I particularly love the range of light to deep orange trimmed by that blue which is nearly purple. Great way to start the art walk. "And now for something completely different!" You MUST visit Claudia Lynch's website to experience this Corset Shoe and many others. 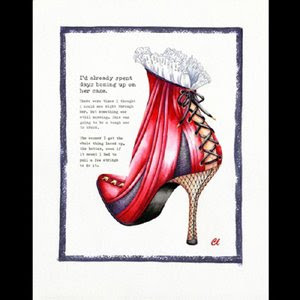 She produces fabulous art prints of the most clever shoes with stories to go with them in a mood Mickey Spillane created in his mystery detective stories. The story for this shoe starts out with "I' already spent days boning up on her case" (...bones...corsets, get it?). Another favorite is a checkered boot with a story that starts with "I knew all about her checkered past". You just haven't seen anything like her clever work, please visit her by clicking her name above. best book for Christmas by an early and close friend of Marilyn's who took many photos when she was still Norma Jeane...and yes, he says, there was originally an "e" at the end of Norma Jean....and that gives you a clue as to the intimacy of their relationship. I finish with two prints from Kees van Citters, a Dutch painter I discovered at the Palo Alto Festival of the Arts a few years back. 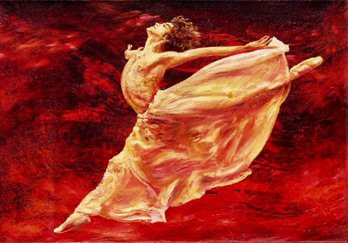 His large canvasses with brilliant colors, many against black backdrops, are just out of this world. I mean, LOOK at the stretch he captures in these two dancers...amazing! This concludes our art walk, but I want to tell you I will be featured on the Hot Rocks Glass Jewelry blog in March. The exposure will be much appreciated. mixing these two together for some of my Valentine jewelry and decided to have heart pieces year round (as well as cupcakes) since there is such a wide variety of components. Pink heart jewelry will be the most prominent. And Hearts are also now a theme in my MomsArt shop as well. 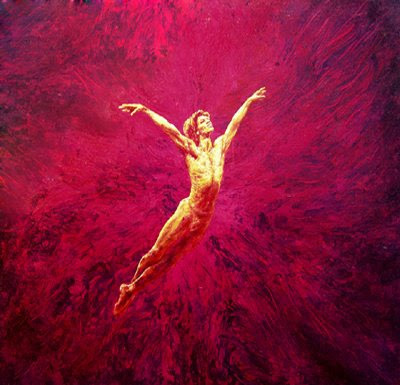 Thank you for joining me on this Sunday art walk...hope you enjoyed losing yourself in some beauty for a while.